The Leader in Charge may get permission from the Site Warden to use a field for games etc. As the grass here is cut by power mower, it is most important that no pegs, irons, stones, wire coat hangers etc., are left lying on the grass. No permanent structure may be left on the site, e.g. railings, gadgets etc. are to be taken down at camp end. The cinders from fires are to be put in metal barrels marked CINDERS ONLY in the fire area. Rubbish should be separated for recycling where possible. Firewood and Gadgetwood are to be stored in the areas marked out for them on site. Drivers are asked not to speed on roadway to the site due to proximity of school. Vehicles are not permitted inside the entrance gate. There is a fee of €6.00 per head per day payable to the Site Warden for the use site. A booking deposit of €50.00 in advance when returning your Booking Form. Cheques payable to Piercestown Wexford Group, Piercestown, Drinagh, Wexford, Scouting Ireland. 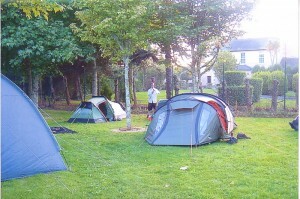 Groups must pay their Camping Fees before leaving the site. Group Neckerchief/Scarves should be worn by all when visiting Piercestown Scout & Guide Campsite at all times. Permission to camp on, hike to, or use Piercestown Scout & Guide Campsite must first be obtained from the Site Warden. Please leave Knockingall Organisation Community Centre Campsite in as good (if not better) condition than you found it. Other than married couples, male and females campers will use separate tents which must be pitched with due regard to privacy. Wives and children of Leaders are permitted to camp, but children remain at all times the complete responsibility of their parents. The Piercestown Scout & Guide Groups cannot accept liability in the case of personal injury to visitors and/or campers, or for the loss and/or damage to their property (including vehicles), no matter what the cause may be. DON’T cut any growing timber. DON’T cut gadget wood on borders of site. DO leave a good impression of Scouting/Guiding in the Parish of Piercestown or anywhere you go. DO if in doubt use your common sense. DO have a good time at Knockingall Organisation Community Centre Campsite. DON’T bring any cars/trailers into the site due to constrictions inside the site. Car Park is available across the road and up the road beside church..
DO remember to come back and visit us again. We would ask all Groups using Piercestown Campsite to remove their waste with them or dispose in the appropriate bins on site. We at Piercestown Campsite promote the Recycling of waste and ask all Groups that use Campsite to separate this waste into the following areas, Paper & Cardboard, Food Waste, Plastic, Glass, and Tin Cans. Bins are provided to facilitate this. If these bins are full please use plastic bags. Please clean all containers of food before placing them in the bins.